Having plants at home amplifies your space aesthetics and we have been telling you this since day one. Plant in its original untampered state is a majestically calm beauty to have. And we understand the love you hold for plants and the amount of interest you invest in choosing the right planters or pots. A perfect piece of nature i.e., plant, requires an equally perfect planter. Your plant pot should justify the charm that your plant holds. Choosing the planter can be a difficult task altogether. The process of choosing the right planter can be a tedious task as it requires a lot of consideration. First, you need to choose the right plant based on the space available at home, do a little research and understand which location at home is best for which plant. Based on numerous such reasons, you will head out to buy a perfect planter for your beloved plant. Out of all the available options like the metal planter, wooden plant pot, soil pots and fiber pots–you’d make a decision based on your home type and design style. Pro Tip: Fiber planters are best for any space, be it interiors or exteriors. Their easy mobility and classy finish make them an ideal choice for the green decor in almost every space. The amount of effort you put in choosing planters should NOT suffice in it staying immobile at one place for years to come. Instead of just placing a planter in one isolated location (though that may as well work considering the type of interiors), you can do a whole of creative things with your planters and plants as well. Planters can be arranged in multiple ways in order to enhance the overall look of your respective space. Here we have discussed a few ways you can try at your home and experiment with your plant look creatively. If you have chosen to buy planters with extra width then you can certainly stack them up this way. Long planters can be stacked up over one another creating a different pattern altogether. There are specific stable planter boxes available in the market which will help you attain this beautiful dimension easily. this placement either in your garden, at your porch or in any place that requires a different green touch. You don’t have to stick to the usual decor plants for your indoors and outdoors. You can go creative even when choosing a plant for your planters. The best way to start is by getting herb plants. They won’t just look good but also act your personal herb stock. Since their size is small, you can actually have a stack right near your kitchen window. It’s like having your kitchen garden. You can decorate your garden border by placing planters in a sequence. You can play around with colour and different sizes as well. But the best-suited border is created when you get the same size planters and place them accordingly to create a border look-alike. If you have a backyard garden which is in front of the wall then you can get big size planters and place them in a sequence to make it look like a wall in itself. Get a couple of big sized rocks as well if you wish to have rustic look. Place them in line with your planters a create your own natural forest-like area. Moreover, you can place planters in your stairs and create border-like sequence there itself if there are no grillings. Placing plants in sequence creates a natural and beautiful border to almost anything. Gone are those when you could only keep plants on the ground. Wall gardens in trend these days and if your home or office gives you enough space then you can actually try out these wall gardens for yourself. You can either get yourself separate planters which you can hangover or fit on the wall in a sequence or you can get a legitimate wall garden standee on which you can place pots.There are multiple options available in the market. This type of sequence looks best with small planters. 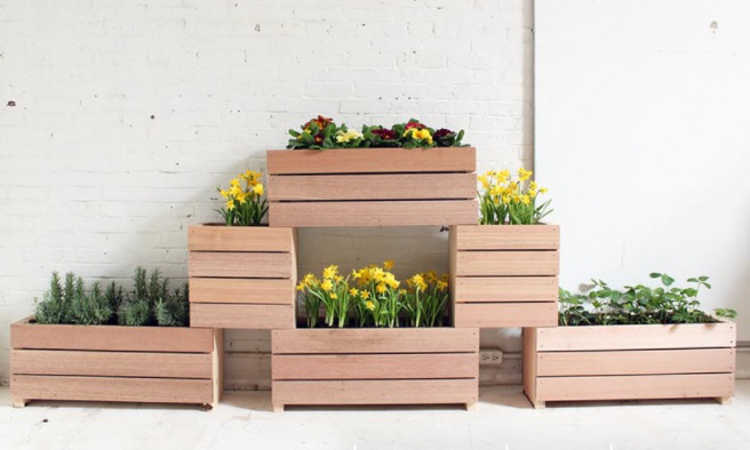 If you are restricted to space then creating your own vertical planter is an ideal option for you. All you need to do to is to join them in a wooden pallet or decide the pattern you wish you have and fit them on the wall accordingly. Planters can also be used to create a personalized fountain for either your garden or for your forefronts. All you need is some tools and you can do it all by yourself. There are multiple videos on YouTube available to help you out with this. Even in the market, while buying planters you can get them properly holed and turn them into a proper fountain. Nobody said that you have to stick to planting only plants in your pots. One planter, multiple uses. Leave gravity alone for this decoration. Hanging plants is in trend plus the best part about these planters are that they go almost everywhere. Whether you wish to hang in the balcony or wish to place them in your interiors near your window, they will look amazing irrespective of the place you keep them. PLanters that are specific to hanging are available in the market. Or if you wish to do it yourself, then go on and start crafting. Take on your colour pencils & paper and awaken your art and craft nerve. Get planters in solid colours and redo your desired funk to personalize them even further. Based on the size and colour of planter you can do multiple things. If you are placing a planter near your library you can paint book-like icons on them, and if you are placing a planter in kids room then you can paint cartoons on it. Basically, when it comes to crafts, you can do numerous things on them. Be it small or big, options are numerous–all you have to do is to spark the ideation. In mid of all this arrangement don’t forget to maintain your plant properly. If you are making a border like sequence with planters then you better see to it that the plant you choose can thrive on direct sunlight. Similarly, the planter that you choose to hang must have a trail-like plant potted in. Don’t be ignorant when choosing the right plants for decor. Furthermore, take notes on when to water the plants and when not to. Over-watering can also kill the plants at times or make the leaves go brown and shed eventually. Planter placement is highly important. Navigate your home and accordingly decide which size planter you wish to get. And when the potted plant starts growing properly, repot it in a bigger planter. Plants also need air to breathe and proper expansion of their roots is immensely important. When having a walled garden, take extra caution in terms of water management. You don’t want your wall to go all messy because of the excess water drainage. Bonasial manufactures fiber planters that enhances the beauty of any space. Be it your home, office, or hotel that you wish to decorate, we have planters that will fit your design aesthetics seamlessly. We offer fiber planters in different designs, sizes and colours ensuring that you never have to compromise on your design scheme. Bonasila has a team of designers who hold almost 18 years of experience; thus each design that we produce is thought-through and carefully market-studied. In-house team of craftsmen bring life to these designs with A-Class fibreglass. We have vowed towards quality and promise the best to you. From resorts to corporate offices, our planters have become the first choice for architects, interior designers and landscape artists across the nation. Contact Bonasila today to get yourself the ideal planter and amplify your space aesthetics with the green element like never before.